Recently, Fred Wilson has expressed an interest for a Family CRM Service that can organize and store your family contacts in an easy to use fashion. 4. Mobile apps to access the application. After reading the post, it hit me. Tonido workspace is a perfect solution for this problem. My wife and myself use the app to store our family contacts and calendar. Even though it doesn’t satisfy all of Fred’s requirements, the missing parts can be easily done. Tonido workspace allows you to import your contacts through ical files. You can tag and filter the contacts. It has a family calendar. 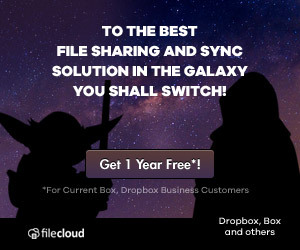 It also supports tasks, notes, files and p2p synchronization of workspaces among family members. 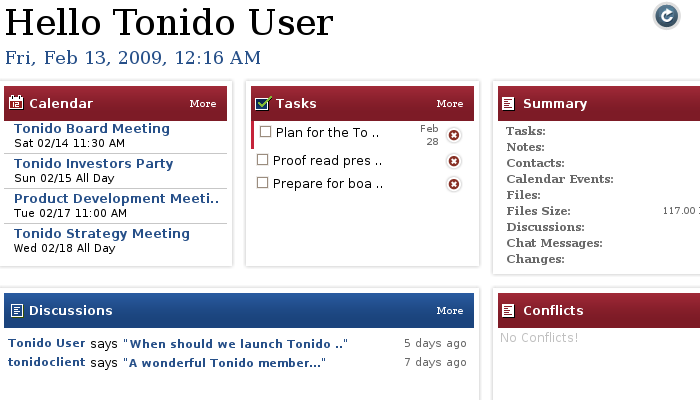 The coming Tonido version will also have a guest user support so that all the family members don’t need to have Tonido in their computers. The most interesting part of Tonido workspace is that it employs a hierarchical information scheme. What it really means is that any workspace objects (task, event, calendar, notes & Files) can be a sub object of other objects. Say you are organizing a Christmas Party. You can enter “organize Christmas party” as a task. 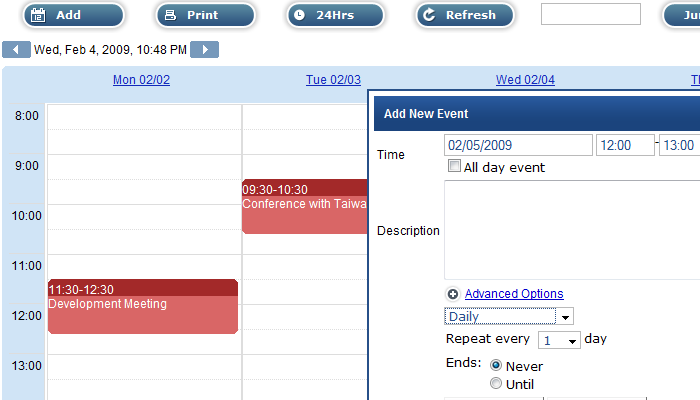 Under the main task you can include all the contacts that you would like to invite. You can insert other sub tasks like order food, buy party supplies and send out invites under the main task. Also you can set a calendar event for each of the sub tasks. The app is quite powerful and easy to use. The beauty is that it will help you to streamline your task organization. Currently the app doesn’t have the email ability as Fred has asked for. That can be added. Also we don’t have the native mobile apps for the application. Still you can access the app from a mobile device through a web browser. 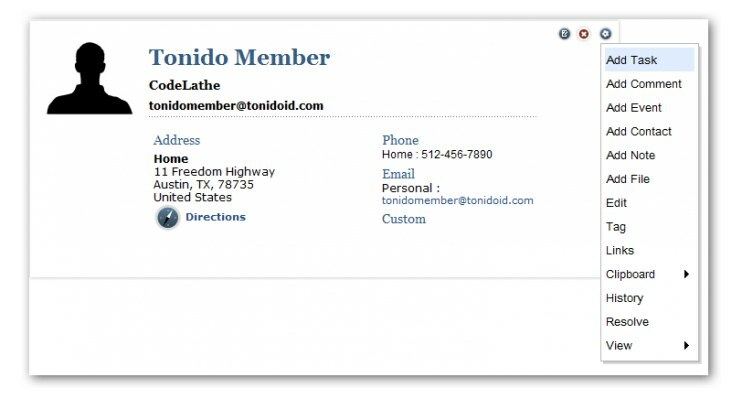 We are currently building native Tonido apps for iPhone, Blackberry and Android. In the next iteration we can include workspace support in the native mobile apps if there is sufficient interest. Like any other Tonido application, Tonido workspace is completely self hosted and you can run it from Windows, Mac, Linux or TonidoPlug. You don’t need to depend on an online service and worry about the privacy of your personal data. It also can be used as a light weight CRM for startups and small teams. We use it everyday in CodeLathe. I can tell you it is incredibly useful. Check it out and let us know your comments and feedback. First off let me say how much I love tonido. I am in the IT field and administer large sharepoint sites. I was looking for something to use for my own personal use and while sharepoint will work, I did not want to Set up as server in my house and then have the headache of managing it. Tonido workspace is great workaround. 1. The ability to view my calendar on my iphone through an app and not the browser. 2. The ability to sync contacts with my phone. 3. The ability to send email or sms reminders for upcoming events and tasks. I really believe there is a big need in today’s time for as personal “workspace” system that people can install locally and not have to worry about where there data is being stored.